This page is primarily for Southport Waterloo's road runners. About half the club's membership is made up of senior road runners and they compete in cross country and road relays as well as road races. The club organizes Grand Prix competitions for series of road, fell and trail races each year. See below for more details. The road runners have training sessions on roads, in pinewoods and on the track. See the Training section of the About Us page for details. All Abilities, walk, walk/run, run. Supportive to those wanting to start running or develop their running. All sessions are free to Southport Waterloo members so come along, join in, meet your fellow members and improve your running. Note: Tuesday and Thursday – Strollers is open to non-members on payment £1 per session. Other groups offer 2 weeks free trial prior to joining so come and try us. For further details of the sessions and their suitability to your needs and running development contact Road Running Secretary Malcolm Teale malcolmteale@gmail.com or Tel: 07496-667 698. The Club organises a members-only annual Grand Prix competition linked to performances within a series of local road races. For 2019, 9 events have been selected for inclusion in the Grand Prix. The best 5 positions will be totalled to decide the Grand Prix male and female winners and the male and female veteran category winners. Club colours must be worn unless race rules / conditions require otherwise eg guide vest. A mixture of distances is included. 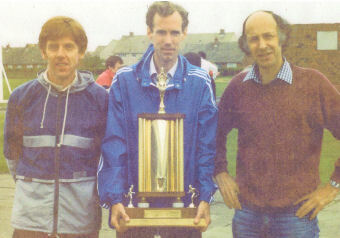 Trophies are presented at the annual awards evening at the end of the year. 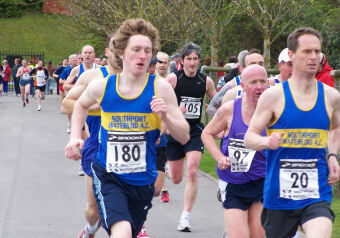 The Club also organises a members-only annual Grand Prix competition for fell races. The best four results decide the winners. A mixture of distances and difficulty is included. 2.00pm. Barley Village Hall, Barley nr Burnley. Lee Pollard memorial race (formerly Henderson's End), BM 12Km/426m, 7.30pm Rivington Hall Barn. 3.00pm, Showfield, Quernmore Village crossroads. 3.30pm Beetham Sports Field, Beetham, nr Milnthorpe. Boulsworth Fell. BM 10.5Km/300m, 11.00am, Race field (opposite showground), Keighley Road, Trawden. Thieveley Pike. AS 7Km/400m, 11.00am, St John's Church Hall, Holme, Chapel-le-Cliviger, nr Burnley. Congratulations to the 2018 champions John Sprackland and Michelle Spencer. The Club adds to its Road and Fell Grand Prix with a Trail Race Grand Prix from 2019. Like the others, it is members-only and linked to performances within a series of fairly local Trail races. For 2019, 10 events have been selected for inclusion in the Grand Prix. The best 5 positions will be totalled to decide the Grand Prix male and female winners and the male and female veteran category winners. A Merseyside Grand Prix of road races was introduced in 2013. Runners don't need to do anything to enter this. Southport Waterloo is registered with the Merseyside GP Co-ordinator - Tim Warn of Penny Lane Striders - and so our runners are automatically included. The races in the 2019 series are as follows. The intention is to include a range of distances. Organisers will prefer races organised by Merseyside clubs. Awards are presented at the end of the season. For those people who enter the London Marathon and are unsuccessful in obtaining a place in the open ballot, there is an opportunity to obtain a guaranteed entry. Some places are reserved by organizers for club entries and Southport Waterloo has one place available for which a ballot is held. Click here for the club ballot Rules. Ian Kilshaw; Sarah Pickerill; Matthew Tobin; Fleur Culshaw; Catherine Fearnley; Lee Coupland; Catherine McElhinney; Rachel Jacks; Jodie Rimmer; Heather Goadsby; Jeff Caunce; Tracey Barlow; Annie McCaffrey; Paul Warrington; Keith Swift; Jane Blacklin; Liam Harris; Gina Bellhouse; David Marsh; Katy Coupland; Mandy Bradbury.. The following statistical analyses were prepared by Brian Grice. They have been discontinued since 2017 and are included here as an archive. Results from past Southport Waterloo races can also be seen on the Results page. Copyright © Southport Waterloo Athletic Club 2019 All rights reserved. Southport Waterloo AC is affiliated to England Athletics and UKA.